Avion Windows, Refurbishment Projects, Uncategorized, Vintage Resources, Avion Ads, brochures, etc. Spoiler alert—be sure to visit our Rock Guard Rescue Part I before jumping in here! In this part II blog post I am going to review how we made measurements and decisions on how to best do the “THREE R’S” (rescue, repair and re-invigorate) our classic original Avion rock guard. As mentioned in our previous blog this was a junk yard find and it is NOT one of the knock off reproduction ones currently being made out of fiberglass (see photo at end of this post for sample) or other such materials. I will put some links to how to video’s and sources for rock guards at end of this post for those who are not as lucky as we have been to find an original for sale. So once we had our junkyard find home, it was time to decide the best course of action for restoring it to its former glory and functionality. But wait….could we do more?? Could we jazz her up a bit with some subtle “bling” and wow factor?? YES! But how? without going too far and destroying the classic Avion look and we did not want to offend those traditionalists and preservationists who would not want to see too much altered–ours is a classic after all. First step was to put our new-to-us rock guard on two saw horses to support the hard plastic form and to prevent any torquing/flexion which could cause some unwanted cracks. It is best to have two people handling these rock guards. This was done in preparation for a good, gentle cleaning. We decided to take measurements of the existing original Avion logo stencil so that we had them for future use to make a stencil ourselves for other possible purposes. Also so that we would have photo references to show for before and after looks, etc. or to assist anyone who is looking to replicate the logo because they have a knock off repro, etc. You can see by the large photo above that our logo had been touched up by hand by some former owner. Honestly they did a decent job but this was no where near the quality look that we wanted. Also note the bottom right photo where you can see the nicks and missing paint off of the round edge. From the facebook Avion Owner’s site managed by Mark Obinterio here from their files are PDFs of both the older avions (pre 80’s and the newer Avions) in case you want to download, print and use. We knew we wanted our rock guard to be somewhat of a “Rock Star” when it was finished. The rock guard is a very prominent feature of this trailer and what people see first when you are coming into a campground or rally. It is also your “front door” so to speak about what kind of rig this is and when down is your hallmark. At least this is the way we view it. We are very proud of our Avion and wanted her to have her best foot forward–quite literally all the time. So after much consideration, and review of sample sheets of aluminum being put on the rock guard (Chuck Cayo had given us these actual samples of aluminum that he uses for his body restorations on Avions) we decided on a “grey” that would best compliment our aluminum trailer body and be just slightly different so it did not look like we were trying to match the aluminum…rather we were trying to compliment it. Below you can see where I went to Lowes and picked up a variety of paint chip samples in grey’s and also the red we ultimately chose for the lettering accent color. It was not easy to decide on what level of darkness of grey we would go with. We did use the center aluminum piece as our guide and ultimately chose the one that I have encircled with blue pen. We did this paint swatch so that we could see what it looked like in daylight, dusk, and with our porch light on so we could really make the best all around decision. The rock guard is a large piece and it would be a large and highly visible swath of grey. We felt the one we chose would look rich and classy and if/when it faded would still have the contrast to the aluminum Avion body we wanted. You will notice the final paint chip above is a Dover White. We had the brainstorm to have our auto body fellow also paint the underside of the rock guard in this white in a high gloss finish. This way when the rock guard is closed due to windy days (yes, please keep your rock guard latched and locked down in wind…they will flex, crack and or could even get ripped from the hinge on windy days-it does not take much- these are like big hard rigid sails on a ship!) the high gloss will actually help to reflect BACK into the trailer your lights you have on inside on the dinette table, reading lamps or ceiling fixtures. As of this post we have not tested our theory but are convinced this will be the case. How we know is that currently when our rock guard is closed, it really creates a dark grey cave-like feel. So looking out the front window and seeing white will help a lot! When I posted this idea on the Avion Owners Facebook page, one of the long time owners said …wow…what a great idea! Guess we were the first to try this experiment in 46 years??!! Off to the Spa for a FACELIFT! A very frequently referenced blog post that was originally posted on the AS forums. This project really was quite well done and could be replicated for an Avion no doubt. YouTube Videos how to make your own rock guard. This is a photo (at right) of a circa ’80’s Avion with what appears to us to be one of the reproduction/replacement fiberglass rock guards available from Cayo. See our resource page for their contact info. BE SURE TO SUBSCRIBE TO OUR BLOG SO YOU DO NOT MISS A POST! Winter Storage Tips-Protecting your “Innards”! We are among tens of thousands of RV owners who due to many circumstances (work being ours) we cannot just pick up stakes and move to follow the “70’s” (temperatures that is!). That day WILL COME….but just not now! So we, like many will do the annual ritual of putting our RV “to bed” in winter storage. I thought I would share with our followers some tips and pointers that we have employed and picked up along the way from other veteran RVers. New to our routine this year is the employment of low voltage LED tube rope lights on the floor underneath the perimeter of our 1973 Avion 28′ travel trailer. In following one of our all time favorite fulltimers, AStreaminLife.com, Steve and Courtney have promoted the use of under trailer lighting to ward off mice and other varmints when camping in the great outdoors. Using their suggestion, we have purchased solar powered spot lights (check out AStreaminLife’s Amazon shop for the ones we purchased based on their excellent reviews) to use when boondocking and then the above pictured LED Rope lights when we have electric hook ups available. Well, so we got to thinking that if this has worked for them in the wild….why would it not also serve as a good deterrent indoors? Since our RV storage garage (we rent near our house) has electricity (and we pay a little more for that each month) why not use this low voltage LED rope lighting we purchased to use while camping….during the winter too! I akin the look to a bit of a “STAR WARS” effect! We have consistently put rat/mouse bait traps in and around this garage for the past two seasons where we have stored our Pewter Palace. This has been more of a preventative action but we have seen where the little green bait blocks have shown some “tooth wear” from nibbling varmints so yes, they are there. BUT we have, knock on wood, not had ONE bit of any hint of varmint intrusion into our RV itself. NOTE: for the purpose of this blog post, I am not going to go through the entire black and grey tank dumping and prepping procedure or the system flushing for long term storage. I am purely focusing on interior tips for winter storage to protect from varmints and any damage to interiors. Remove ALL and ANY types of food stuffs, oils, herbs/spices -ANYTHING that acute little noses could sniff out and consider a potential food source during bleak, long winters. Remove all liquid, aerosols, pumps and semi liquid items including canned goods because freezing will cause them to burst and create a total mess (not to mention serve as a glorious buffet dinner for varmints)! Our throw pillows, lap blankets, table clothes bagged in scented bags with Bounce sheets inside too! Remove any rags, towels, pot holders that may contain even trace of oils, food handling, etc. Varmints love to nest in cloth and paper goods like paper towels, napkins so remove them too and use them at home over the winter or store for next summer…..if you leave anything hang it on a hook or put in a scented trash bag with a Bounce brand scented dryer sheet in side bag with items. Wipe off all counters, refrigerator inside and out, stove top, table tops, sink, dish drainer, cutting boards, pots/pans with a Clorox bleach brand pop up style wipes. Use a Clorox (or similar) brand pop up wipe to go over interior and exterior of refrigerator, toilet, sink, tub, all handles in kitchen and bathroom areas in particular. We strongly recommend tilting up all mattresses and cushions that are in your sleeping and dining areas if you cannot or chose not to remove these completely and store them at home over winter. Not only does this provide less of a “hacienda of dark seclusion” for any varmint intruders to build a nest, but it also provides far more air circulation around such materials thereby inhibiting mold, mildew, etc from building up on both the cushion/mattress and the boards that lay underneath them. Doing this we have (knock on wood here…) never had any issues. Below you will see on the left photo, our dinette cushions standing on long end and one of our twin mattresses on its side. Note the other bagged items and placement of dryer sheets all around too! These bags do contain comforters, extra throw pillows, beach towels. We DO take our bed sleeping pillows home for winter storage and do not leave them on the RV. What about Clothing Storage over the Winter in the RV? We do keep a complete set of camping clothing on our RV at all times so we are ready to go at a moments notice. We keep things organized by putting items in plastic lock lid style shoe storage boxes (they fit best in our over bed cupboards) and under bed lock lidded plastic totes, so winter prep is actual pretty minimal. Bounce sheets get put inside the floor of all drawers and then on top of any items left in drawers. Bounce Sheets also get placed inside every overhead storage cupboard and placed in every scented trash bag that is used for linen storage. I am sure to remove any liquids, eg. perfume, deodorants, mousse, hair spray cans/pumps, etc. due to potential for freezing/bursting. Check bathroom areas and remove from all over and under cupboards from bath area too! We remove any leather shoes/sandals due to potential for dusty mold and leather could be a food source in a pinch for varmints. I leave things like rubber flip flops, crocs, etc. Final Steps… that are often forgotten! Remove ALL batteries from any flashlights, headlamps, portable radios, clocks, alarm clocks, kitchen devices, etc. and TAKE THEM HOME and use them over the winter. Ensure you have correctly used RV antifreeze in your systems and retain some visible in the toilet bowl and put an extra dose down each sink drain to ensure there is some sitting in traps and bends in piping. Be sure you have put Bounce sheets also in all interior AND exterior storage/mechanical areas like water heater box, oven fan area, exterior refrig access panel area, sewer service area, exterior storage areas that go underneath dinettes or beds, etc. Here you can see our furnace and sewer pipe vent area being protected with dryer sheets. If storing your RV outside in winter the issue of “to cover or not to cover” is going to be yours. It is recommended that all aluminum campers like our Avion and Airstreams NOT be covered because covers can adversely scratch the surface. That being said, we do know Avion owners who have had decent luck with covers-much will depend on where you live. If you do use a cover, be sure you allow sufficient ventilation so that mold and mildew do not happen inside the RV. If your RV is outside in winter, be sure to check pressures, treat the tires with tire protectant and cover them from daylight with either a tire cover and/or sheet of plywood, etc. Close all curtains to prevent fading of cushions and interior finishes-especially if wood interior like ours is. If you have those pseudo fabric type pleated horizontal blinds I believe it is NOT recommended to drop them down as the pleats will stretch out and the shade will not look or work well in future. Perhaps in this case, if no curtains are available to draw closed, then take some old sheet, cut it up and place it over the valance and hang down over window to prevent interior fading while keeping the fabric blind up and pleated for storage. We do not recommend installing Reflectix or similar silver insulation batting on windows because you may cause undo condensation on interior of windows unless you keep ceiling vents open to allow air exchange. Plus, using Reflectix inside on windows will create a totally dark cave inside your RV which is what varmints would just love! Spray all locks (storage bays, doors, hitch locks, spare tire locks, bike locks, etc) with your preference of lubricant to keep in good shape when not used for length of time. Put RV house batteries on trickle charger. Chock your wheels, sounds crazy if you are on a level garage, but its just one of those things Kevin is fixated about…but its good practice because once you get in the behavior of always chocking your wheels you are less apt to forget when really needed! You have NO IDEA who may be able to access your storage area……why take a chance? Lock your RV doors even if in a locked storage garage. Apply your hitch lock even if RV is locked in storage garage. As possible visit your baby at least once a month over the long winter— just to do a quick visual check around the inside and outside and to hug her and let her know you miss her and cannot wait to get back taking her camping again! Safe Travels! We LOVE to hear your feedback about this post or any of our blog posts! We purchased our 1973 Avion in September 2016. Quite a birthday present for me if I do say so! Our rock guard (original to 1973) was in decent shape, with the logo faded and some stress cracks at the angle support hinge area on top. Both of these “age-related illnesses” are ones that are very common and frequently seen in Avions especially those pre-1980’s. (you can easily see the cracks in photo below). The previous owner to us had done a decent repair job on that right crack by reinforcing with a piece of steel behind it and filling in the crack on the outside with Parbond or something similar, but now after two years of our use we started to see the left side begin to show more of a pronounced stress crack too. These cracks in the solid formed hard plastic original rock guards like ours are common due to the sheer weight of the guard and the jiggling, torquing and bouncing it experiences when rolling down the road even though it is locked in at the bottom. Hey, and our baby has done Alaska 2xs, California at least 4 times and Florida annually for at least 6 years—so after a total of 45 years and having only these cracks in her is truly not bad! In May of 2018 we had taken our Avion out to Cayo Repair in MI to have some work done and on the punch list was to sure up that left crack to prevent further damage and to ensure that it would hold, at least for a few more years. Chuck Cayo did a decent job with it which you can see on photo below where the rivet stud backs are showing through the horizontal piece of sandwiched steel plate. But we knew at some point the inevitable question would have to be addressed to repair again or replace completely. In the photo below you will also see where the two support hinges mount up underneath the top inside of the rock guard. These hinges bear the full weight of the guard when opened (as shown) but also lock in place in the pull latches on bottom edge center of window to lock the guard in place for towing mode. Thus all the stress is there despite the long tubular hinge that connects from the guard itself to the rig. The photo below clearly shows the system by which the rock guard is “hung” to attach to the trailer body. (also the horizontal steel plate repair by Cayo) .The body has a receiver tube as we call it that the guard slides into from one side. It takes two people to effectively and safely remove or install the guard to the rig using this system. The sheer weight of these original guards is a lot. Newer replacement guards are being manufactured by Cayo RV Repair in MI and some other private owners these days. I believe they are made of fiberglass and therefore far lighter which is a good thing, however the ones we have seen are all black which we do not care for at all. We prefer our muted grey which blends in with the aluminum body of the trailer better. Here is a good photo for comparison, ours being on the left with its original as is condition, the one on the right is the fiberglass black replacement. To Repair or Replace….THAT is the Question! We knew we had only really two options with our ever growing cracks in our original existing rock guard. Try to once again do repairs to our existing one in hopes to sure it up sufficiently for the wear and tear it would eventually get once we begin full timing in a few years. Never Underestimate a Sunday drive to VT! It brought us a TREASURE FIND or TWO! One sunny Saturday in July 2018 I suggested to Kevin it would be nice to go over to nearby VT to scope out some potential campgrounds where we may wish to stay in coming years. We like to physically see the campground and identify specific sites that we take note of for future calls for reservations. We wanted places that would be grandkid-friendly and relatively easy to get to distance for us and for my daughter and son-in-law to drive to as they would be transporting the two grandchildren to us for a camping weekend. Living in eastern upstate NY we can be to VT in a matter of 40 minutes. Our trip that day took us over through Cambridge NY and then into the Bennington and Manchester VT areas of mid-state/western VT. Using just my google map locator asking “campgrounds near me” we found several close by with no problem. Our third one to visit though was the charm. Not because we would want to end up camping there (no amenities, mostly all very run down, entrenched seasonals) but because on our way out the driveway Kevin shouted STOP! (I was driving) “WAIT…THERE IS AN AVION!”. Yes, it was, abandoned and sitting among wreck, trash, bits and pieces from other trailers. It was the campground owners graveyard of discards from two generations of ownership. Yeah, they did not ever throw anything away! Thank goodness!! We pulled off the drive and into the graveyard. Wrangled over debris and checked her out. Appeared to be a 1988 but the rock guard looked really, really similar in design and size to ours. The poor rig had had a tree fall on her, breaking her center spine and was left in the graveyard to fill with rain, leaves, etc. etc. and used for storage, sort of, for perhaps a decade or more. But the rock guard was crack free, moveable and hopefully would be ours! We did have a tape measure with us, took measurements and tried texting and calling Cayo and posting on the Avion FB pages quickly to see if anyone could answer our question about if size of this one was same as our ’73 which of course was safely and out of reach back in NY. A couple online FB Avioners replied they thought it would fit, but if the price was right, even if it did not fit ours, there was surely a market to sell it to another Avion owner who could use it. That was enough security for us! The owner of the campground came by driving his backhoe to gawk at these unfamiliars climbing around his Avion. No worries, nice guy and Kevin quickly sparked up a perfect, nonthreatening conversation to allay the owners fears that we were some city slickers. We are not, we are North Country folk too and Kevin knows his mechanicals, trucks, etc. to dazzle any New England car/truck junky. After a very short and amenable conversation the deal was struck, tools offered to assist us in the guard’s removal and within about 15 minutes the new rock guard was being hoisted by Kevin and I into our Suburban. Reddy our Cavalier Spaniel who had come along for the ride was not quite sure what this big canopy was coming over top her bed! This ends Part 1 of our ROCK GUARD RESCUE. BUT THERE’S MORE LUCK TO BE FOUND! Never underestimate what gems you may find on a Sunday drive! Not more than 15 minutes down the road from rescuing this rock guard did we see a much earlier Avion (can you spot it in first photo below?) at a horse show along the road. We veered quickly there to see that too! And to our sheer delight, it belonged to a woman who ran a mobile embroidery business who was actually based out of CT. Turns out it was a 1974, 23′ Travelcade. She had pretty much gutted the inside but had done some tasteful redecorating in prep for her boutique. She was making custom designed hats, shirts, jackets for the horsey set. She needed an awning for her new Avion soon to be traveling boutique on wheels. Perfect! We struck a deal to trade our old Carefree Awning system hardware for some custom designed clothing using our trademarked Avion artwork that we had commissioned an artist to do for us in 2017. This was truly our double lucky day! My next post will be on the Rehab phase! Until then…safe journeys! Sharing Holiday Joy from NY to AZ! Along the way of our past six years of researching, planning and dreaming about our eventual “full time RV life” we have enjoyed and learned from many who have taken the plunge before us! Among those who we respect and have learned from the most are a handful which include at top of our list, Steve & Courtney from AStreaminLife. We have followed their journey from their initial change of lifestyle decision, to sale of their house, to downsize and deciding what trailer to get (Courtney was totally new to camping and RV life while Steve had grown up with parents who RV’d tons!) , to their first year commuting daily from full time RV living in a local KOA campground in Tucson AZ, but keeping their day jobs…..to their first years + now full time on the road. Each episode they post on YouTube we learn something, laugh (at sometimes Steve’s dry humor jokes) share similar likes, dislikes and we know we are far more better equipped when our day comes because of them and others who have taken the journey and are willing to share their successes, failures and “whoops” candidly and honestly. So this year, in the season of thanksgiving for many blessings we have, we also wanted to let Steve and Courtney know how much we have appreciated their friendship and effort to allow viewers like us to be included in their daily life. We knew they were going to be coming up to the ADK’s hopefully this summer and that they loved to visit and film waterfalls. Well, we know the DACKS are full of neat spots but knowing Courtney loves the “epic planning” part of their trips we sent a Christmas present to them in Scottsdale AZ where they were going to be celebrating with Courtney’s folks over Christmas time. Included in our gift to them was a travel guide to ADK waterfalls, and each of them got a pair of socks befitting to their lifestyle and their tastes. Steve’s socks were a custom beer bottle (he loves craft beer and breweries just like Kevin does!) and for Courtney I picked out a pair of socks that had a camping theme complete with trailer, campfire, etc. It appears they loved them and we are so happy for that! Here is a clip of their Scottsdale AZ video published on their YouTube Channel. Specific reference to receiving our Christmas present socks (and showing them off) is at about 5:47 minutes in–HOW SWEET OF THEM TO THANK US IN THIS VERY PUBLIC WAY! WOW-did not expect that and they have over 11K YouTube followers!! Please watch the whole video (and their other videos on early retirement how to and RV living and travels to magnificent places in the USA!) so you can learn more about who they are and you will see why we enjoy following them on their journey so much. Better yet! subscribe to their YouTube Channel and see the many valuable and educational videos they have posted from selecting a generator, to downsizing tips, to finding the perfect campground…or the not to perfect dip into a BLM spot that got them stuck AND cost them a portion of an underbelly pan which had to be repaired! BTW- they typically camp in exactly the same kind of BLM and private campgrounds that we know we plan to go to as well…over this Christmas ’18 they are in Cave Creek which is a town Kevin and I have spent quite a bit of time in already as it is only about 35 minutes north of where my son David lives with his wife Bri. Kevin and I had already checked out and put the campground in Cave Creek (Cave Creek Canyone road below) on our list of must stays. It’s that time of year that I am beginning to dread more and more each year….winter is coming! It is marked by falling leaves, the need to start our car for a few minutes to “burn” off the frost from the windshield and now this weekend….the proverbial need to ready our Pewter Palace for the coming of the winter hibernation. This is a photo of the first November we owned our 1973 Avion when we had not brought her to the inside storage yet. It is recommended by many who own Aluminum trailers to NOT cover them! I took this photo from about 1 hr north of where my Son and his beautiful wife life north of Phoenix. It was early October. Can I handle seeing this kind of view out my door each day…you Bet! But for now…it is a process of putting our Avion snug in “the carriage barn” ( our rented RV storage unit) which keeps her high and dry, away from the elements of snow, ice, and sleet. BTW for those of you who are contemplating an aluminum beauty, be it an Avion or our cousin the Airstream—please know that it is NOT recommended that these trailers be covered with the traditional RV cover sold at many camping supply and RV dealerships. The covers can actually mar your aluminum finish and wreak havoc with your rig. So owners basically have a few options: they are “chase 70, put her into a garage/RV storage barn, or at minimum put your trailer under a strongly built pavilion/roof that will keep snow off the rig, but is open on the sides. NOTE: A simple search on Google will net you all sorts of “handy lists” in PDF etc that you can download and print off to do your check list to button up your rig for winter. We recommend you check those out. Perhaps even some of our fav bloggers may have some! So, the Pewter Palace is being prepped for winter this weekend and over this coming week. Here are the basic steps we do and then some of my videos will go into a little more details both inside and out. Shut off ByPass to the Hot Water Heater. Lift up the “blow off valve” and get a 5-gal pail and put underneath and unscrew the plug and let hot water heater completely drain out. Go to the city water and using my air chuck threaded for the water line hook that up. Use an, oil-less portable air compressor to blow all the water out of the lines. Kevin set’s it at 30lbs of pressure to blow out the water from all the lines. Push the pedal and the spray nozzle in the toilet, and also shower head to be sure all water is drained out completely. Pour RV (pink) antifreeze into toilet bowl , and all other drains including the shower, kitchen and bath sinks and then be sure to pour at least a few inches of antifreeze into the toilet bowl when closed and check the bowl for evaporation over the winter as you want that liquid to be in the bowl to keep the seals moist. We leave all the faucets open all winter, all low drains open, holding tanks are drained. Outside, he gets is 2 foot extension for the sewer line and his yucky 5-gal pail and he pulls the black line let it drain out any remaining. Shut and then do grey water whatever may be remaining. Take this and dump it. He takes a little bottle of water and bleach solution to clean the bucket and then store. Then disconnect the two foot sewer host, spray off with bleach and water solution and let dry. Put on a winter cap on to the sewer connect. (he has drilled a few small holes in it for ventilation but small enough that no critters can get in). It is suggested to spray the black and grey sewer valves and push in and out a few times to lubricate. We keep our valves out and open to allow air flow. Our tanks don’t stink at this point! (also as side note, we highly recommend UNIQUE brand RV Digester. Check out all about that here in one of our past blog posts: Its All About the BLACK TANK! Remove all liquid products (again, our garage is great and secure but NOT heated!) from under the kitchen sink, bathroom sink and also the bathroom closet. Use them over the winter at home or place in storage closet at home where they can hibernate too till spring! Remove all food stuffs, spices and anything remotely food like from the rig. Anything that could even remotely explode with freezing temps, or whose scent might be attractive to starving varmints. Wipe down the inside of the refrigerator AND freezer area with a mild cleanser that does include either bleach or at least an antibacterial cleaning solution to ensure you have a squeaky clean fridge. Use some sort of block/holder to keep the doors open for the winter storage time. Do not let them close! Pool noodles work well. We already had one of the hard plastic ones from Camping World so use that. I actually think the pool noodles are better, that hard plastic thing is easy to knock out by accident! Strip beds, clean all bed linens and place all sheets and blankets from beds into scented (we use Febreeze scented lavender) draw string kitchen trash bags and label if needed. Lift bed mattresses and dinette seat cushions up on their side to allow air flow in and around them thereby reducing chances of any mold and also critters getting more room to hibernate in darkness. We store the scented bagged linens on wood part of bunks next to the mattresses. Here is a brief video to show this part of the winter storage technique. 4. I then take BOUNCE brand fully scented (knock off brands do not work…we have tried them!) and I place at least two in each cupboard including under sinks, in pantry area, in clothing and bath closets, around toilet area. I also place them in and around all the mattresses, bagged linens, dinette cushions, etc. There are varying reports of these working but I know from over 7 years of experience they have worked for us. We also use them for decades when we are reenacting camping on our tent floor cloth and under our cots and bedding to keep insects, mosquitoes, beetles, spiders, snakes etc out of our tent…and it definitely works for that too! 5. In the bathroom closet I pay extra attention (and more Bounce sheets) because this is where some of our exterior systems/hoses are coming in to the rig. Including where our power box is on outside and near where the sewer intakes, etc are). Here you will see where not only have I put Bounce sheets all over the floor and shelves but I have also hung a store bought (from Vermont Country Store) Mouse deterrent herbal bag. It says it lasts a few months. I have not used this specific brand but it says that it is good for nearly 100 sq feet–so with this cabinet shut it will more than do this bathroom area! 6. Lastly, a few other places on the outside to put Bounce sheets. We put a few in ALL of our exterior storage bins and also most definitely in our exterior sewer area, power box and also hot water heater compartment area. Again, these are all areas where there is a potential for a varmint to shimmy through even the smallest of openings-they only need the size of a penny or dime to get through! Last but not least, give your rig a really good vacuuming and wipe down all counter tops, table tops, bath fixtures etc. I use Clorox Cleaning Cloths. Do you keep your “camping wardrobe” in the closets? We do but again, there are Bounce sheets in all closet floors and shelves. We also store smaller clothing items in plastic snap lid bins all the time above our bunks. I have put Bounce sheets tucked in between totes and on lids here too. Do you keep your pots and pans, cookie sheets, and silverware onboard in winter? Yes, and we have always done this with no problem. Obviously in spring if we see any sign of mouse droppings or nesting, then everything will get a full sterilization in our dishwasher at home, but otherwise just a good wipe down does the trick each spring. Do we keep toilet paper and paper towels under RV sink cabinets. NO! we do not. These items provide a huge attraction to varmints looking for nesting and bedding materials. We take those paper products home and use them up over winter in our apartment. Do we close our blinds and curtains. NO we do not. In fact, those of you who may have the day/night pull down fabric type shades your manufacturer may caution you not to do keep them down all the time. It releases the factory pleating too much. But we keep our curtains open during winter too. Because our garage is dark, there is also no need for us to shelter our interior cushions, and linens from sunlight by having our curtains closed. How important is it to have your tires up on board or something and not in contact with the cold driveway or dirt? VERY! For the best life and safety of your tires, please drive up on at least 1-2 inch thick boards. We actually drive our rig up on those heavy industrial rubber mats that can be purchased at Lowes or HD. They have holes in them, which allows for ventilation but also as Kevin notes, rubber to rubber is the best of all worlds. You can see a little of the black mat in our video clip above. We also keep these mats down all year because they make a great way for us to know exactly where the RV rear should be when backing in the trailer after a trip. No guess work for me! This year we are also going to be laying some LED warm white rope lights on under our rig to keep on 24/7. We learned from Courtney & Steve of AStreaminLife.com that they have found that by putting some sort of illumination under their rig they have been spared from any mice infestations–even when camping in boondocking fields. So since we do pay $15 extra per month for electricity in our storage garage, we will put these low voltage rope lights on. We just purchased two spools in the lighting section of Lowes today (better quality than Xmas section). These are the kind and quality that store owners may purchase to go around their display windows, etc. They were $38 for a 48 foot length. We bought two so we can go just inside both wheels and full length and width of the rig with no problem. We will use them on extended camping stays with power too. For boondocking we will get four solar spot lights (tip from Steve and Courtney too!) so we still will have lights to ward off critters. You do not want critters in your rig…ever! Especially when it becomes your full time home. 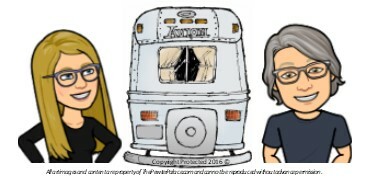 See some yucky videos from both AStreaminLife and from LoLoHo bloggers on their issues with mice in their Airstreams. No fun! That’s all we have time to share for now. We will stop in and visit the Pewter Palace a few times over the winter months to check on her. Over the last 9-10 years, Kevin and I have put considerable time into researching, planning and beginning to execute a thoughtful plan towards our goal of “going full time” RVing. In this blog post we tell you about four of our most favorite RV bloggers/vloggers and include a little about them and links to their blogs and YouTube channels. They are entertaining, inspirational, educational and oh yeah…..travel to amazing destinations! This is not our rig, but very similar to our first RV a 1998 Itasca Sunrise, 32′ Class A. No slides, under powered, but wetted our appetite for more! Originally and shortly after we sold our Class A 32′ motor home back in 2012 we realized then–after she was not in our driveway, how much we missed life on the road. Albeit at that time, and it continues, we only get to do long weekends and the occasional big trip of a week or two around the eastern half of the USA but—each time we do we are more and more convinced this is the right path for us. We also know it is not for everyone. Along our journey we have found some truly inspirational friends in bloggers/vloggers who have chronicled their similar journeys from the decision to forego the traditional and head into the non-conventional life of making a rolling home….your only home. We also have learned there are many variances in between this. Some people live a portion of their year on their RV while returning to their sticks N bricks for the rest of the time. More times than not, these are snowbirds who fly south in the winter RV in tow (or behind the wheel) and spend a warm and sunny February in FL, AZ or TX. There are others who “escape” the brutal hot sizzling summers of those same places for their “camp in the northern woods, cottage on a New Hampshire lake or the beach family compound on Cape Cod or the rugged shores of Maine. For many and varied reasons they prefer (or cannot quite imagine not having) a structure to call home base. For us….that decision was easily made. We did not want to be tied to the maintenance of our rolling home AND the maintenance, cost and distance filled with concerns about the safety, etc. of a northern sticks N bricks home base. We would rather have what we own on our back so to speak and know that where ever we wanted to be…we would be and that could change from year to year, season to season depending on where the wind and whims blew us. I personally have owned one home or another since 1982 and I am more than ready to not have that responsibility. We simply do not want to deal with frozen pipes, switching out storm windows or raking leaves in our retirement years. Been there….done that….done! So we watched, learned, read, and chatted with many who have made similar decisions such as ours to “go full time”. This is not a decision we have made on a whim. But don’t be fooled, we have some family and friends who think we are nuts….and others-like my adult children….who are totally supportive and know we will succeed. After being “RV-less” for about three years the itch became unbearable. We started falling for Airstreams but did not want to do a total restore and ones in road worthy, camping shape were out of our price range. Quite by accident we stumbled upon Avions. Their iconic aluminum, rounded exteriors, quality interior and exterior build and their reputation for excellent tow-ability had us sold. It took us another two years to find one we wanted….and although we had anticipated having to fly across the country to buy one, we found one on Craig’s List right in VT not more than 15 minutes from my daughter and son-in-law’s house! We purchased our 1973 Avion, 28′ LaGrande in September, 2016 (some Birthday gift for me eh??!!) and we have never have looked back. Each month we grow more and more fond of her. We sold our house in Oct. 2017 and moved into a townhouse apartment all under the methodical plan of incrementally doing our downsizing exercises in prep for full time RV life when we retire. Below are a few of our very favorite bloggers/vloggers and for various reasons we have noted underneath each one. Along the way we have internalized and put into practice some of their suggestions and methods, and in other cases it forced us to have heart to hearts with each other to realize….yeah, that may have worked for them…but we will be more comfortable doing it “our way”. Watching literally hundreds of hours of YouTube videos (we subscribe to most of our fav’s so we don’t miss an episode) to reading countless articles and books on the topic….we have grown in our understanding of what life is like on the road…and what we as a couple expect from the journey, each other and life in general. It has been a good way to learn…together to prepare for this next chapter. Less Junk, More Journey: Marisa and Nathan. Once again, these are “kids” as we refer to them as…basically Marisa is one year younger than my son, and Nathan is three years older than my daughter. I am sure in some way I live vicariously through them and their journeys trying to imagine them as extended family. Kevin and I will often refer to them as “the kids”. Their blog has some terrific, easy to navigate pages like their FAQ that really gives you a terrific way to see their answers to many questions you may have about how they made their decision to go full time, steps they took, etc. Their young daughter, Hensley is a year younger than our grandson Lucas and a year older than our grandson Sawyer. She has been on the road since infancy and it is so fun to watch her explore, learn and travel with her fabulous, down to earth parents. Watching where they go, how Hensley enjoys it and some of their methods for keeping sanity on the road with a toddler has given us great ideas for when our grandsons are with us in our RV (it is our hope and plan that they will do more and more of it as we have more time to travel) Their Blog Their YouTube Channel. Thanks for tuning in. Please visit our friends above. and PLEASE……Let them know that Kevin and Luisa Sherman from “The Pewter Palace.com” turned you on to them! Safe travels and please subscribe to our blog so you don’t miss a another post! October 2018– We have just come back from a five-night stay at the Villages at Turning Stone RV campground which is owned by the Oneida Indian Nation who operate the Turning Stone Casino and Event Center complex a half mile down the road. I have a nice short video further down in this blog post that will give you a great idea of what the individual sites look like! I have posted a very comprehensive review on one of our favorite campground review sites of which I am a member–CAMPENDIUM.COM. You do not need to be a member to check out reviews…only to post them! Here is the link for my review of the Villages at Turning Stone RV Campground. I have gone to Turning Stone each fall for the last three years for a convention for work and I have to say this was by far the most enjoyable stay yet! I loved being able to cozy up in my bathrobe by the open campfire at night after being in windowless conference rooms all day! Plus it saved a boat load of $$. The RV park is very affordable (our rate, $39.95 including taxes with Good Sam discount) at this time of year. This was for a full hook up paved site overlooking one of their small ponds with tons of room and privacy. Cable TV and very decent internet service. live shows, cafes, bars/nite clubs etc and never have to drive no matter what time of day or night. They make it easy with a phone call or via the main valet at the casino. They picked me up right at the end of our loop driveway every morning to go to my sessions. There is not a lot else to do in the immediate area. Rome has good history, Fort Stanwix National Historical Park is there with large recreated fort and wonderful visitor center. Rome also has movie theaters, live theater, restaurants, shopping, etc. and is less than 20 minutes away by car. We stayed in Loop 100 (1) and site 121 which was awesome, wide and private and backed up to the boat pond area. Here is a video shot from our campsite. Please check out my full review on Campendium so you can also see photos of the bath houses, showers, common buildings, and more. We definitely will be back to this RV park in the future. Oh…by the way, visit my review to hear about the train! Happy travels from Kevin and Luisa in the Pewter Palace! We love our Avion, but lets face it, at under 200 sq. feet there is precious space for everything! Our kitchen is no exception. By the way….did you know that in some of the original sales brochures we have seen for ’70’s era Avion’s they called the kitchen/galley the “entertainment center”! What a hoot! I figure that is because many women during that time were stay at home wives and mothers and spent a lot of time in the “kitchen” so when it was time to get away in their Avion and travel they were “entertaining”, not slaving in the kitchen! So back to our project! Our front area had been altered from a jack knife sofa to a banquette dinette area by the previous owner as I have mentioned in previous posts. So we were without the small angle/corner cabinet at the end of the kitchen counter area to the right of the kitchen window. We have found a perfect (love it!!) covered ottoman/box (see photo at end of this post) that serves as storage, a footrest and as a spare seat if needed inside or outside. But the ottoman is low and does not help with needed counter space. I had seen on many other RV videos where many B+ and others have installed the flip up extension to their counter with locking hinges. I decided that we no longer needed four wood snack tables at our apartment (just two of us anyway!) so I decided on re-purposing a solid wood snack table top for our Avion’s kitchen counter extension. I purchased two of the brown locking hinges at our local Albany RV supply store for under $10 each. I like the way the brown blended into the cabinetry and also the fact that they are lockable is very important so once the extension is tilted up and deployed it stays put. Be sure when you are installing them that you are putting the correct long side on the top so that when you want to fold the table extension back down you are gently lifting up a little to disengage the lock and then lower the extension. I have found some similar on Amazon, linked here but the locking mechanism is a bit different than ours. There are plenty of types and colors available on Amazon but oddly, no brown. I like our brown with our trailer. We used the side that shows on top in photo below as our “top” which got secured to the underside of the tray table top. Tray Table Stand: After gathering needed supplies we proceeded to un-attach the wood snack tray top from its wooden scissor “X” stand. Our snack trays had been purchased from Walmart years ago but I believe they still have them. Going onto Walmart.com now I see only sold in a four piece set with holder for about $60. But I believe our local Walmart store sells them in person as singles and price is under $10 each. Here is a link to one on Amazon that is similar in style to what we used in case you want that as reference. Below are photos showing the scrap board we used behind where we would be drilling and then screwing in the bracket hinges. This provides great extra support. The scrap wood does not impede the drawers from closing. Be sure to use a thin enough piece so the drawers still go in but sturdy enough to be a reinforcement for the hinges. Use your measurements on the outside to then draw your measurement/placement for the scrap wood on the inside of the cabinet wall. Use your level to ensure you are positioning the hinges level so that your extension is level too! We did pilot holes through the cabinet base and directly into the scrap wood. This is where the helper comes in because someone has to hold the vertical scrap boards in place while the hinges are being drilled in. You can use double face tape, etc. to hold them in place if you do not have a helper. In order to be sure that we had the position of the holes for the hinges correctly placed on the underside of the extension table, we made a paper template up. Once the hinges are on, and you have your template ready, you are ready to drill pilot holes into the underside of the snack tray table. Here is a great trick (see video below) Kevin used to be sure that he did not drill into tray table any further than needed and poke through the top by accident. Just a little strip of duct tape put around the drill bit at the bottom most measurement needed for the screws so that the screws would secure through the hinge and into the table extension without poking through. Once all pilot holes are drilled, once again here is where a helper comes in handy. Place the extension tray table top onto the first hinge. We started with front most hinge and insert screws from underside and up into the tray table top. Then do back hinge. It helps to have someone holding onto the tray table and exerting just a little downward pressure on the extension table top to ensure a good bond. What I like most about using the already finished tray table is that it gives an immediate finished look unlike if you just slapped a pine or square sided oak board there. These tray tables are built to handle dishes, water, food being dropped on them, beverage glasses sweating onto them. They are pre-finished, solid and have held up for over 10 years and still look nearly new for us! Here is a photo (above) of the finished project with the extension down. You can also see we measured and positioned it optimally so that it did not impede me being able to pull out and get into the storage ottoman either. We are really, really happy that we have just DOUBLED our useable counter space for the cost of under $30 and about a half hour of project time work. Can you tell by the video that I am really excited!! Let us know if you take on this project for your RV so we can post it on our facebook page and share your results with others to inspire them! VIDEO OF THE FINISHED PROJECT! SO EXCITED!! Safe journeys! Remember if you do this or a similar counter extension project let us know!